Colonial Marine Private First Class Zula Hendricks is AWOL and on a mission to prove her mettle by eradicating the Alien species. She must battle with xenomorphs, fend off space pirates, and elude the insidious Weyland-Yutani corporation that wants their freighter back, all while facing rehabilitation from an old war injury. 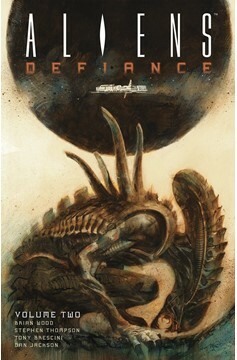 Collects Aliens: Defiance #7-#12..